I've watched with interest as Mark Padgett took on the project, originally as part of his Permaculture Diploma, working in collaboration with the Salvation Army. It certainly wouldn't have got as far as it has without the ongoing help of Greg, who kept the project moving when there was little interest or involvement from the wider community. 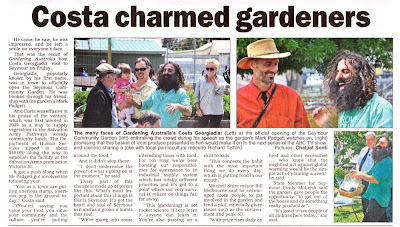 While I don't know Rick, I hear that he has given the gardens a real push more recently and developed the Seymour Community Gardens website, which I was quite impressed by. Credit to the whole team, especially the volunteers who have transformed the wasteland behind the Salvos Op Shop into a beautiful space that brings local people together. The gardens connect in well with the Salvos, with a large section dedicated to provide food for the kitchen that offers a community lunch for locals on Fridays, while another section make plots available for individuals or groups to manage themselves. The community lunches are well attended, with 50-100 people turning up each week. I see the gardens demonstrating, particularly those who rely on support from the Salvos, that you can provide for at least some of your own needs by growing food yourself. Here's an inviting way to do it. For those who don't know, Costa is the presenter of Gardening Australia on the ABC - and a poster boy for the permaculture movement here in Australia. I haven't seen Costa on TV since his show on Channel 31, where (from memory) he wandered the backyard gardens of Coburg in the mid 90's - but I did watch a YouTube clip that he did recently on the ABC about Taranaki Farm. 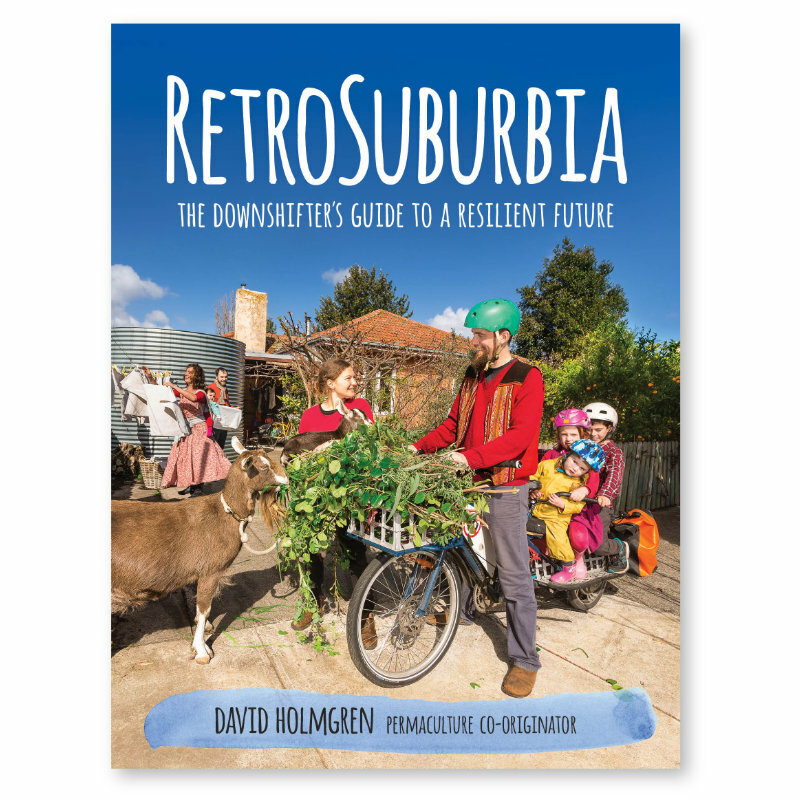 In talking with him at the opening I was impressed by his passion in encouraging people to grow their own and his disgust of the industrial food system - bring permaculture to the people. He gave some great examples during his 45 minute presentation on making a 'green smoothie'. In his captivating 40 minute 'performance' before making the smoothie, he discussed how food is medicine and that growing your own food is the best medicine there is. Industrial food (which isn't really food), backed by the chemical industry, is making us sick with fertilisers, insecticides and GM crops, then keeping our heads just above water with pharmaceuticals. He spoke of supermarketing. That's what supermarkets are really - super marketers. For example they have convinced many of us that paying $3 for a pumped up bag of chemically grown lettuce leaves picked days ago and sprayed with something to make them look fresh is a really good deal. But is it? You can buy a packet of organic seeds from places like Greenpatch for around the same price, that will feed you, your family and your neighbours for generations - just let a couple of the plants go to seed and spread them round. Look after them and you'll get super fresh, organic lettuce that will put a spark in your day, everyday. And it's much closer than the stupermarket, now that's convenience! Then Costa went on to make a green smoothie using lettuce along with other greens that I picked from the gardens. Growing our own transforms us from dependant consumers to responsible producers. Very interesting. We've been learning all we can about permaculture ever since we first heard about it a year and a half ago. I didn't know that Costa was a permaculture guy in Australia. We've looked up everything we can about Sepp Holzer, Geoff Laughton, and Bill Mollison. Good post.